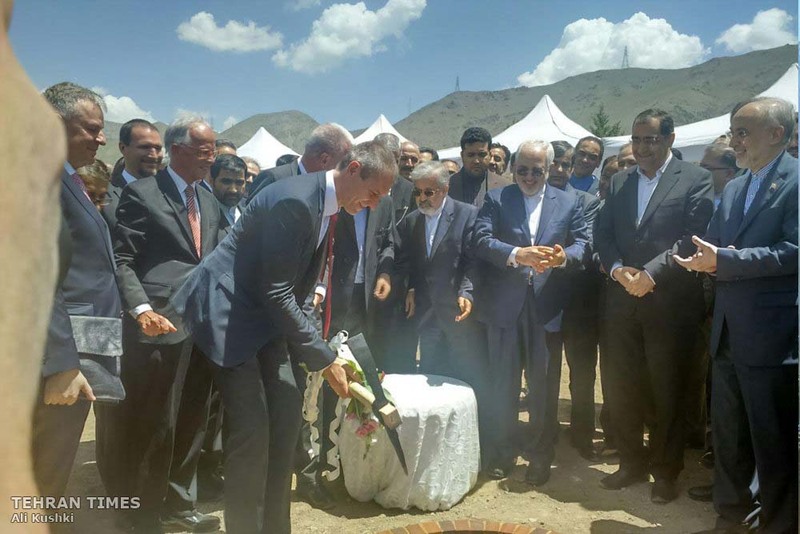 KARAJ - Iran began building its National Ion Therapy Center with Austrian help on Monday, in a 200 million Euros project which follow the country's landmark nuclear deal with six world powers in July 2015. Senior Iranian officials, including nuclear chief Ali Akbar Salehi and Foreign Minister Mohammad Javad Zarif, appeared at the launching ceremony for the five-year project with a total treatment capacity of 1200 patents per annum in three irradiation rooms after completion. "We are very serious about this project because it has to do with the health of our people and the project is an indication that the Atomic Energy Organization of Iran doesn't only deal with nuclear power plants and enrichment," Salehi told reporters. Also, officials from the leading Austrian MedAustron, the Austrian Ion Therapy and Research Centre, attended the groundbreaking event. "I'm so happy that in this very humanitarian project we came across a company in Austria, MedAustron, which is a leading company in this technology, to embark on this project in Iran," Salehi said in response to a question by Austrian media on why Iran chose an Austrian partner. Iran's nuclear chief says "we are very serious about this project because it has to do with the health of our people and the project is an indication that the Atomic Energy Organization of Iran doesn't only deal with nuclear power plants and enrichment. To be built in a gross area of 25,000 meters square, the project will use a synchrotron to accelerate protons and carbon ions to cure tough-to-treat diseases such as cancers, preventing an annual currency outflow of nearly €25 million. The Iran already uses other photon- and electron-based radiation therapy techniques and the project will be the country's first endeavor to use particle therapy with protons and carbon ions for therapeutic purposes. The procedure, as compared to photon- and electron-based methods, will result in secondary cancers, fewer complications, and less damage to other organs. The project has non-clinical uses such as experimental physics research. "We finish the construction of the center in three years and it will also take us two years to test installed technical infrastructure," Salehi told reporters at the site. Technological localization, he insisted, is a key component of the cooperation and a "huge portion of the equipment, including power supply and magnets, will be manufactured inside Iran." Once completed, the hospital can also admit patients from nearby countries. Only five such centers are operating in the world and Iran will be the sixth one to join the club. Iran has seen increasing international medical cooperation in nuclear-related areas after the 2015 international nuclear deal that removed sanctions against Tehran in return for it rolling back its nuclear program. The country uses its 40-megawatt, heavy-water Arak reactor to produce isotopes for cancer and other medical treatments. It has already begun cooperation with Russian ROSATOM to build infrastructure for the manufacturing of stable isotopes at its Fordo facility.